The City of Trees is home to a bustling community of brewers, and Mike Francis, Payette Brewing Company’s founder, is leading the charge. Mike was an industrial engineer for Boeing Company in Seattle before abandoning the corporate life and becoming a grain wrangler. After receiving his degree in Brewing Technology from Chicago’s Siebel Institute of Technology, he returned to Boise on a mission and soon after established Payette Brewing Company in 2010. Six years later, Mike’s expanding the brewery’s Northwest footprint and leading the craft brewing charge in Idaho. Payette’s brews have been a staple in Idaho and the Northwest for years, and now they plan to double their output and expand across the western region. To accomplish this ambitious feat, Payette Brewing Co. will be opening a second production facility and tasting room in the heart of Downtown Boise at 733 S. Pioneer Street. The new flagship location will function as the main office and headquarters for the rapidly expanding brewery. What was once home to Bronco Elite Athletics, is now a $4.5 million brewery and tourist destination. We visited with Mike Francis recently to talk about the future of Payette Brewing and the new Downtown Boise facility. Q: Tell us about your new location and why you decided to move to downtown Boise. A: Our new location is down here close to the river by the Greenbelt – that’s one of the biggest reasons why we wanted to do it. With the brewery, there’s the production part of it and the retail side – it’s hard to find a spot that supports a little bit of both. This building ends up working out perfectly where we have a great production space, and what I think is an awesome bar. Q: Tell us about your production goals at the new facility. What kind of brewing system are you going to have? How many barrels can you brew a year? A: We have a 60-barrel brewing system, and our batches are 60 barrels at a time, with a combination of 60- and 240-barrel fermentors. Our initial capacity at our new location is about 40,000 barrels, and the space will be able to grow into about 100,000 barrels per year. 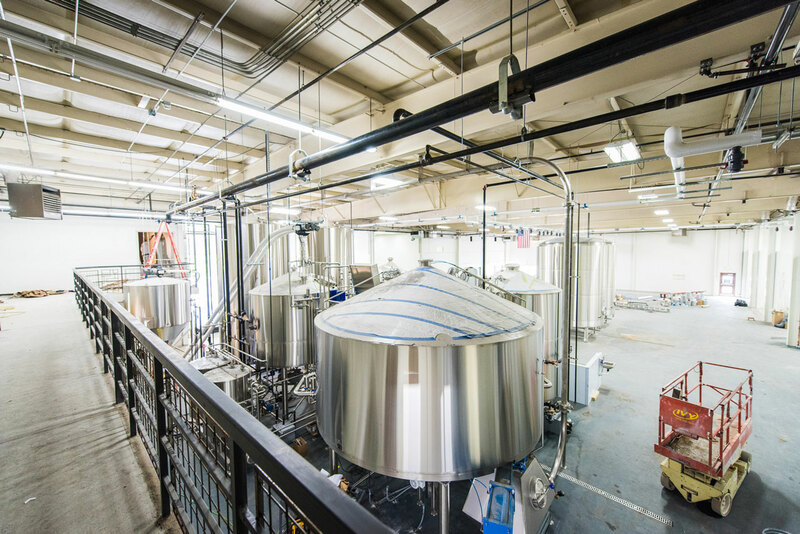 Q: Where does this new facility put you amongst Northwest brewers? A: In regards to brewing capacity, we are right up there with the well-known breweries in the Northwest. The first one that comes to mind is the Elysian Brewery in Seattle. It’s similar in size, and they have a brewing system similar to ours. Q: What’s your hope for how this new facility can affect Boise? A: From a production standpoint, we hope to keep growing and sell more beer outside of the state of Idaho, but I would really like to become a tourist destination, not only for the people in Boise but for the people who are visiting and want to check out the beer scene. Being close to downtown, I think the brewery can add one more cool component to an already vibrant culture in downtown Boise. Q: What’s been the impact of this new facility on Payette, itself? Have you had to hire more people? A: We just hired a handful of people to work in the taproom here, and as we get the production facility up and running, we will probably be hiring some new employees as well. Q: What are some of the new features you’re most excited about in the taproom and the space in general? A: Some of the new features I’m most excited about include parking, the proximity to the Greenbelt, there’s a lot of bike access, and then our outdoor beer garden is probably two times the size of our room indoors. As spring and summer hit we are going to have a lot of opportunity for some cool events out in the beer garden. Q: Breweries often donate to local farmers or develop specific brews to support charitable causes, how do you feel Payette Brewing affects the community in a positive manner? A: Payette Brewing helps the community in several ways; we have the Payette Forward program, where every Monday we do Kegs4Kause, and that will ramp up in our new facility come June. We donate half the proceeds from our beer sales on Mondays to an Idaho-based non-profit. We also brew a beer once a year called the Payette Forward IPA, and one-hundred percent of the proceeds from that beer get donated to a charity that we select every year. Q: Since opening Payette Brewing, what’s your biggest milestone/accomplishment? A: Every day there’s a new milestone, opening this new facility is probably the biggest one now that we are inching closer to the grand reveal. It seems like every year there has been something that I have been really proud of – we have ongoing milestones here, and we continue to grow and have fun as a team. Q: What’s been the hardest part over that time period? A: This facility was a big learning experience for me, the scope of it anyways. I don’t have experience in construction and development, so I learned a lot from that. Every day I’m learning something new, no two days are the same. It’s about being flexible and being eager to learn. Q: Where do you see Payette Brewing in five years? A: Hopefully, we are maxing out our new facility. In five years, we really hope to have our beer throughout the western region and the U.S. – we want to be known as a great brewer that produces amazing products. Q: What is the biggest piece of advice you would give to an aspiring brewer? A: Well, my usual go-to advice for aspiring brewers or any entrepreneur is to listen to everyone’s advice and ignore most of it. Everyone has something to tell you, and words of wisdom for running your business. My advice would be to listen to what everyone has to say because every once in awhile someone has something to say that will open your eyes and take you somewhere new. Q: Can you give us any inside information on some specialty beers coming out? A: We have our five year anniversary coming up. Between our four brewers and myself, I’m technically a brewer; we did Five Beers for Five Years where we split the entire company into five groups with a brewer leading each group. Each team came up with their own unique beer, and so for our five year anniversary, we will be making those five unique beers available to the public. Drake Cooper is the agency of record for Payette Brewing Company. View the work here. Video and photography provided by Tony Andrew and Ryan Posey of Huck. To view more of their work, visit HuckLife.com.